keep the rotational circle small - unless you are a belly dancer with a good back! 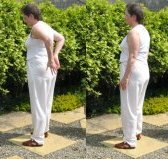 Always do things slowly and comfortably  tai chi and qigong for health and relaxation are not meant to hurt!  ever!